Autism Spectrum Disorder (ASD) is a group of conditions that affect a person’s social communication, sensory processing, thinking and emotional regulation. It is a lifelong condition that has a spectrum of difficulties. Savannah Senior, Clamber Club Expert and Speech-Language therapist, sheds some light on Autism, the signs and how you can help your little one. This means that a child with ASD will have small to significant difficulties in each area of the spectrum. Although many people describe a spectrum as a line, a circle can also be used. This can sometimes give one a better idea that a child may function better in one area and less so in another. 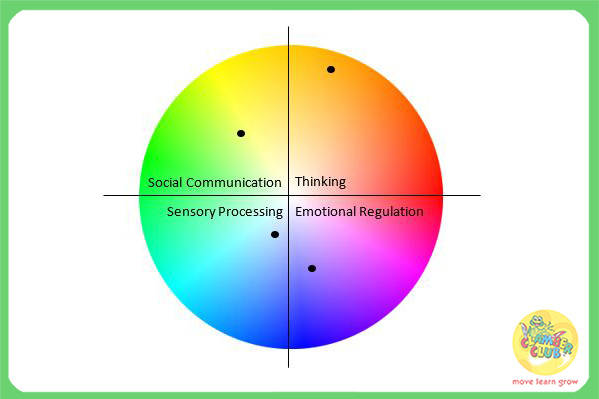 Sensory Processing: The ability to process and integrate all your senses and use them in a functional way. For example, to hear the teacher’s voice, seeing her writing on the board, feeling the pen in your hand = processing this information and understanding that you need to copy the teacher’s writing = motor movements of you writing. Children with ASD frequently struggle to process and integrate the sensory information that they receive from their environment. Social Communication: Communicating with others and sharing joy in social relationships. Children with ASD are impacted in this area of communication as they struggle to understand others facial expressions and body language; are more literal than figurative; struggle to make eye contact; find it difficult to share attention together with someone else etc. Thinking: Children with ASD may think in a rigid manner meaning that they cannot understand or accept alternatives when they were not expected. Thinking ahead may be difficult and new unexpected situations may be difficult. Routines often help with this. They frequently have fixed interests. Emotional Regulation: This is being able to monitor and modify emotional reactions to situations that may distress you. If one cannot emotionally regulate, behavioural difficulties can often be observed. When you are well regulated, you can recognise when you need to implement a regulation strategy such as talking to our friends, taking a break when you need it, sleeping enough, exercising etc. Children with ASD find regulating their emotions difficult and this can often result in self-harm, physical aggression, or inconsolable children. Behavioural difficulties are frequently associated with children who have ASD. It is important to remember that every behaviour is a communication. The cause of ASD is unknown but it is thought that it is a combination of genetic and environmental components. At one point it was thought that MMR vaccinations caused ASD, but this has been extensively researched and has shown that there are no links between ASD and MMR vaccinations. Delayed understanding and use of language. Difficulties understanding figurative language. Children with ASD will frequently take phrases literally i.e. It’s raining cats and dogs. A child with ASD will look up to see where the cats and dogs are. Lack of interest in other children. They frequently prefer to play alone or alongside children. Difficulty understanding their own and other people’s emotions and feeling. Echolalia: repeating words, phrases or sentences (immediately or later) without fully understanding their meaning. Oversensitive to touch, light, textures or sounds. Lack of imaginative or pretend play. Children on the spectrum will frequently play with toys in an unusual way such as lining them up, spinning or opening/closing a toy instead of playing with it as a whole. Difficulty moving from one activity to the next or difficulty getting them to engage in an activity (seems as if they have poor attention). Preference for repetitive activities and games such as lining things up, opening and closing doors, turning lights on and off, putting things in something and taking them out etc. Arm flapping, self-harm, uncontrollable temper tantrums and other behavioural difficulties. If you are concerned that your child is presenting with signs of Autism, seek help. It is best to contact your child’s Paediatrician who will be able complete a developmental assessment and either diagnose your child or refer your child for further assessments. Autism South Africa can also help you on your quest of answers! They can be contacted through their website: http://aut2know.co.za/. Make things visual! Children on the spectrum are usually visual learners. Use pictures to help improve your child’s understanding of up-coming events and situations. This can include photographs, line drawing, visual schedules, showing your child an object/action while speaking etc. Remember that all behaviour is a communication. You can try deciphering what your child is saying by keeping a log of: the behaviour that occurred, what happened before this and how you helped your child become regulated again. Look through them to try find patterns. Copy your child’s actions and play routines to enter their world.